Funding for the Temporary Assistance for Needy Families block grant hasn't increased since welfare was "reformed" in 1996. Since then, the number of families with children living on $2 a day or less has gone up nearly 130 percent. A new report from the Center on Budget and Policy Priorities report shows how inadequate assistance from the program has pushed America's poorest families deeper into poverty during the same time period. 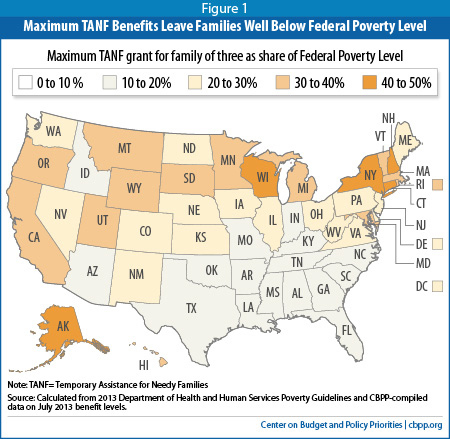 As Stephanie Mencimer at Mother Jones notes, there isn't a single state in the country where welfare benefits provide enough to bring a poor single mother with two kids above 50 percent of the poverty line. In many Southern states, the program doesn't even provide enough assistance to get a poor family above 10 percent of the poverty line. Even when Supplemental Nutrition Assistance Program benefits are factored in, most families with no other income are still below the poverty line.